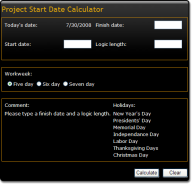 TracTime's construction scheduling software is an innovative, critical path system. It is designed with simplistic ease and user friendliness. Quite simply, it is a robust project management tool so you can manage projects more efficiently and effectively. You can stay informed, control project work, and keep project teams aligned with powerful reporting. TracTime allows you to be more productive through integration with familiar accounting programs. Since 1964 TracTime has been improving the organization of your projects and people through it's scheduling power. Our system allows you to easily report and communicate information in various formats according to your company's needs. Our primary goal is to provide a turnkey scheduling system that continually educates and assists our clients by giving them proper training, productivity and efficiency tools. The very issues that so often drain a project of deserved profits. Like any human undertaking projects need to be performed and delivered under certain constraints. Traditionally, these constraints have been listed as “scope,” “time”, and “cost”, referred to as the “Project Management Triangle”. One side of the triangle cannot be changed without affecting the others. And then there is the product “quality” or “performance”, which turns quality into a fourth constraint. The discipline of project management is about providing the tools and techniques that enables the project team to organize their work to meet these constraints. Take this opportunity to explore your numbers with our tools to the right. Successful construction projects call for early identification of problems and the establishment of realistic goals. Thorough pre-planning avoids the compromises in delivery and quality that might otherwise occur downstream when no other alternatives are readily available. Once the triangle is put into action the construction manager can be more prepared for project variables, thus reducing the risks. TracTime tools bring to construction management the depth of information and solutions that stretch construction dollars. Deliver the best possible reliable software solutions to help our clients improve efficiency and business profitability. To perform for our customers the highest level of support and services. 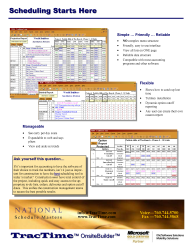 Over the years we have created hundreds of construction templates. If you are looking for the optimum construction sequence for single family, attached, condos, or apartments, then please call us.